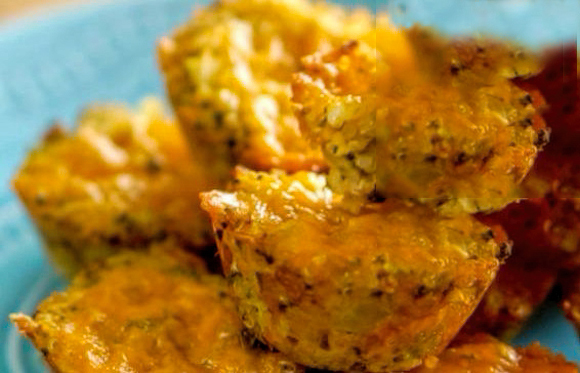 If you love the flavor of Broccoli & Cheddar, you’ll love these mini Broccoli Cheddar Quinoa Bites. They pack full flavor with lots of protein. You’ll have a hard time restraining yourself to eating only a normal portion. They are that good. Heat the quinoa and chicken broth in a medium saucepan over medium heat. Bring to a boil, then turn down to low and let simmer for 15-20 minutes, or until the liquid is evaporated and the quinoa is tender. Preheat the oven to 350. Spray a mini muffin tin with non-stick spray. In a large mixing bowl, stir together all of the ingredients until combined. Scoop tablespoonsful of the mixture into the muffin tins. Sprinkle a little extra cheddar on top of each quinoa bite. Bake in the preheated oven 15-20 minutes, until browned. Use a rice cooker to make the quinoa same proportions (easy no fussing about time or checking to see if done. The rice cooker will stop when it is done and keep warm. No need to rinse and drain the quinoa if you have a pre-rinsed package of quinoa.